Currently ride a 5'6 firewire vanguard which I love for waves and jumps, but have been thinking about a smaller strapless board with grab rails for some flat water tricks between wave sessions. 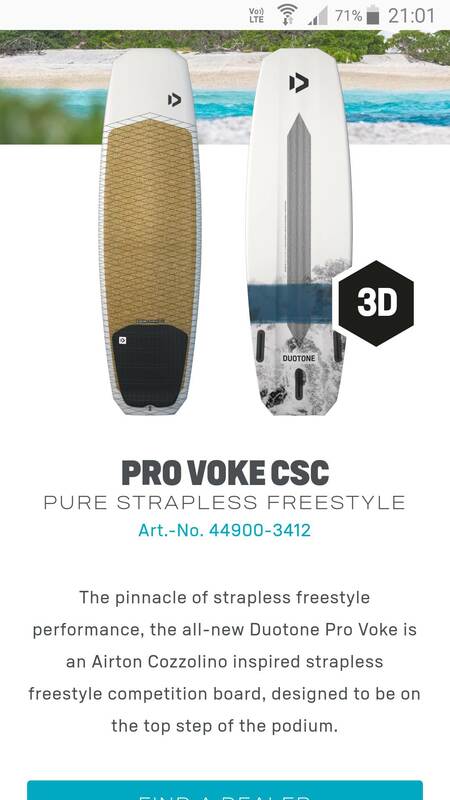 Has anyone ridden the new duo tone voke? Looks good online. But is it any better than my firewire? Is it as strong as the firewire? Does anyone from duo tone want to comment on the warranty on these boards??? ?From what I understand, if your planning on jumping these board and you crease it, then you have no warranty claim. True/false. Im riding the whip pro now, absolutely pusses over my old vanguard. They are so light you have to stop them blowing away down the beach, hence they still like glue. yeah well......so that name change has changed nothing. I have had the pro whip 5'2 for 5 months now of heavy riding and abuse. Jason from WA SURF wanted me on this board to test its durability as he knows im good at breaking sh!t. Thus far the front jump side (going out) has indented a little, but i like that in a board, keeps the foot in place. Has been slung into sand bars and been riding it in 15-30+ knots from flat water to over head high. I love the board. My riding style i would say is more old skool windsurf style (from my background). I try and drift kites as much as i can bit still drive thru flying the kite like you do wave sailing. I like to go in fast and then hack hard. I find with the whip if the wind is on, you have to get the back foot right on the tail kicker, and be like a pro with bent knees, low centre of gravity and really drive into the turns. I have found it will do what you want really, in beacheys you can jus tstomp on the tail and whip it round quick in teh pocket, the low swing and lack of nose allows it to get in tight places. In decent point break waves you can do long drawn out turns like a nose board and then hack away. I like to hit to reverse and this board allows with pleasure. plenty of muscle and back foot and she spins off the lip into a reo with pleasure. the stiffness makes it rooster upwind so easy allowing higher wave count and the channel through the guts of the board seems to take the chatter out of the choppy water and helps the board stick to the water. Each to their own opinions wise but im stoked with the board. Not sure the voke is much of a wave board, more for Airton to do high spinny jump tricks. tail seems quite wide. be fine for small stuff. Speak to Jason at WA surf for more info on board selections and he has demos on all boards. Do any manufacturers actually warranty their boards against being broken through normal use?? I am not just talking about kiting here but for many sports. It has always been my understanding that warranties cover manufacturers defects but if you break something conducting your regular activities then that is just bad luck. Sure some boards are tougher than others and if you break something a good retailer or manufacturer may cut you a deal to maintain customer relations but guaranteeing a board isn't going to break isn't really possible especially for a sport like kitesurfing. If should be that simple however the laws in Australia do not allow it to be. They will basically tell you their Piece of **** china board (way underbuilt for wat they advertise it for*) has nothing wrong with it and you kooked it. The shop is the importer and they are left between a rock and a hard place with a pissed off customer offten offering a trade or some other way to get out of the mess. *if it is promoted for that use and it does not achieve it just mention ACCC and watch the retailer quiver. Recently got the duotone whip csc Pro 5"2 and loving it. Much more fun and better than my Vader for jumps and tricks. It's incredibly stable too and yes much lighter. It does bounce a bit in chop at the front. Vader is heaps faster and looser turns though. Hope the cork layer and pads will make it last long.